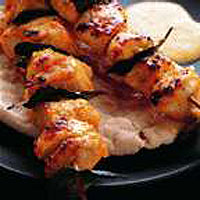 Sosaties are South African kebabs which are traditionally made with lamb. However, the delicious sweet and sour marinade and sauce are equally good with steak, pork, chicken or, as in this recipe, with turkey. Serve with pitta bread and a salad. Place 125g Waitrose Dried Apricots in a pan with 300ml apple juice. Bring to the boil, cover and simmer gently for 20 minutes until soft and then purée. Cook 1 finely chopped onion and 1 crushed clove of garlic in a little oil until soft. Add 2 bay leaves, juice of ½ lemon, 2tbsp curry powder, salt and the apricot purée. Cook for 5 minutes, leave to cool, adding a little more apple juice if required. Cut 4 turkey steaks into 2cm cubes and add to the marinade. Cover and refrigerate for 2 hours. Thread the turkey on to skewers interspersed with bay leaves. Grill for 8-10 minutes, turning until browned and thoroughly cooked. Boil the purée for 2 minutes, stir in a little crème fraîche and serve with the kebabs. This recipe was first published in December 1997.